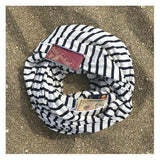 Clever Travel Companion Travel Scarf with 2 Secret Pockets! The combination of style and functionality makes it the perfect travel companion! 100% Cotton, One Size Fits All. Metal zipper pullers, plastic zipper (does not set off Airport security). 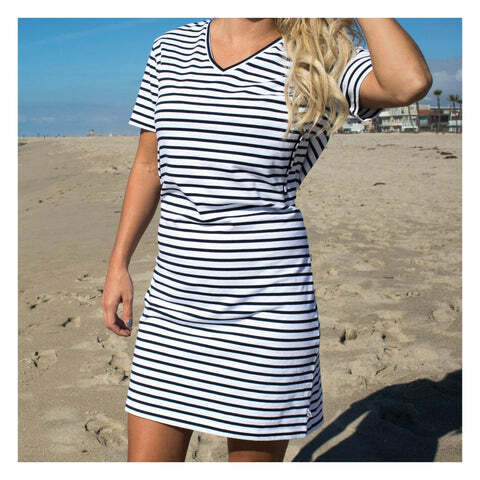 Available in Black or Navy/White Stripes. The Clever Travel Companion's circle travel scarf is the perfect combination of travel chic and style along with practicality and ingenuity - making it a perfect travel companion to keep your valuables safe and your hands free for city sightseeing. With 2 conveniently placed, hidden zipper pockets that will comfortable hold even the largest of smartphones, in addition to passports, cash, credit cards and more.